With 9,330 kilometers (5,800 miles) of coastline surrounded by warm tropical and subtropical waters, Mexico is no stranger to tropical storms. But on September 15-16, 2013, the country experienced a rare double strike as two storms moved ashore simultaneously, one from the Pacific and one from the Atlantic. 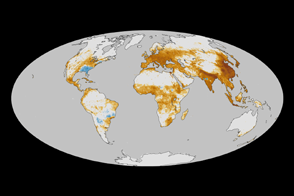 The last time such an event occurred was 1958, reported the Weather Channel. 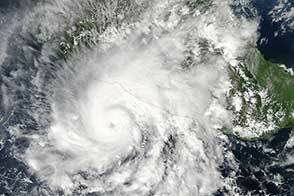 Tropical Storm Manuel came ashore on the Pacific coast near Manzanillo on the afternoon of September 15. Hurricane Ingrid followed suit from the Atlantic on September 16. 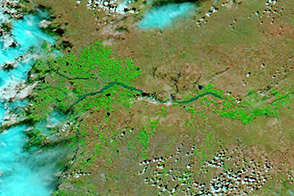 The Moderate Resolution Imaging Spectroradiometer (MODIS) on NASA’s Terra satellite acquired this image of the two storms on the morning of September 15. At the time, Manuel, left, was a tropical storm with winds of 55 knots (102 km/hr or 63 miles per hour). Ingrid, right, was a Category 1 hurricane with winds of 65 knots (120 km/hr or 75 mi/hr). “The storms have affected two-thirds of the entire national territory,” the interior minister, Miguel Osorio Chong, said in a Reuters report. Rain caused widespread flooding and landslides. At least 41 people died in the floods and tens of thousands were evacuated. 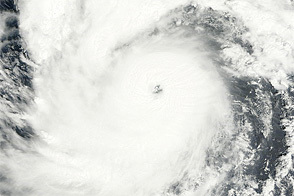 Hurricane Ingrid, the second hurricane in the Atlantic in 2013, tied with Humberto as the strongest hurricane to date. Tropical Storm Manuel may have contributed to weakening Ingrid on September 15. Upper level winds from Manuel may have increased wind shear over Ingrid, essentially blowing Ingrid apart, said weather blogger Jeff Masters. 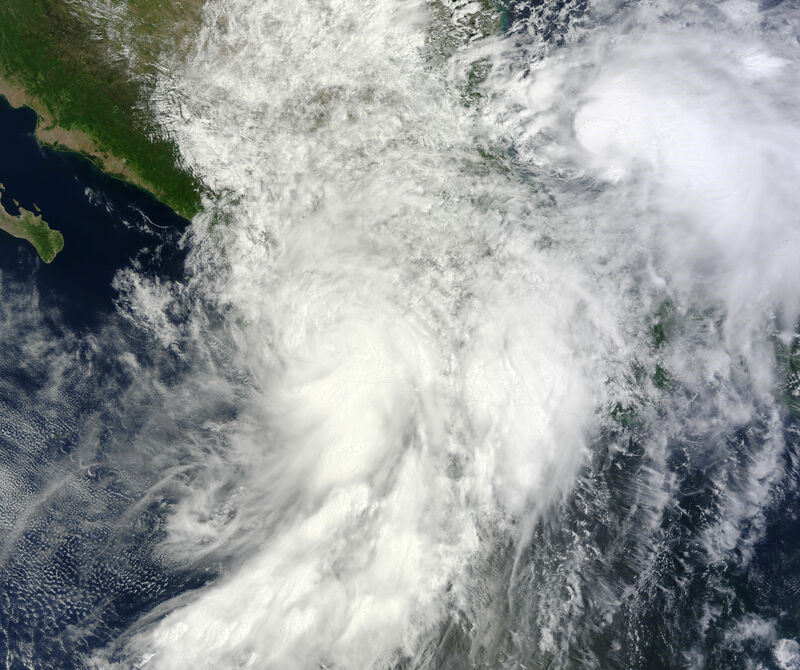 Both Hurricane Ingrid and Tropical Storm Manuel came ashore over Mexico on September 15 and 16, affecting two-thirds of the country at once. Masters, J. 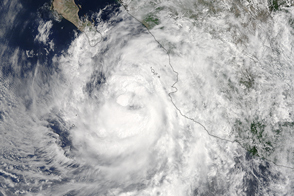 (2013, September 15) Hurricane Ingrid and Tropical Storm Manuel drench Mexico, killing 5. Accessed September 17, 2013. Reuters (2013, September 16) Two major storms lash Mexico, 41 dead amid ‘historic’ floods. Accessed September 17, 2013. 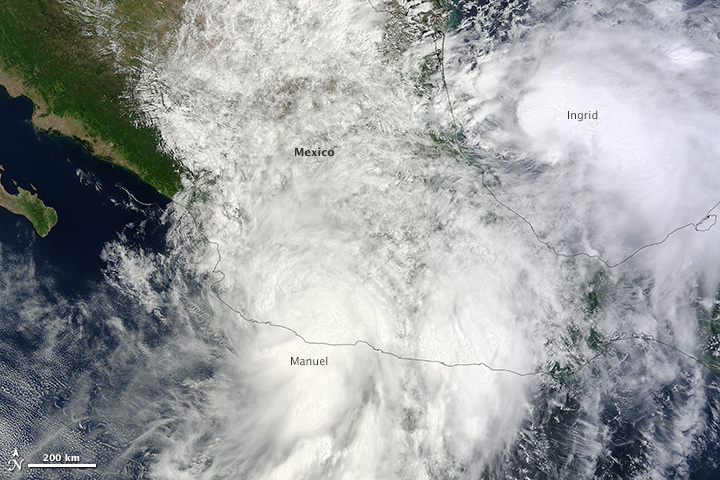 Weather Channel (2013, September 16) Tropical storms Manuel and Ingrid hit Mexico: Death toll rising, rain continues. Accessed September 17, 2013.